Twitter acquired the music discovery service We Are Hunted last year and is using its technology to build a standalone music app, CNET has learned. The app, to be called Twitter Music, could be released on iOS by the end of this month, according to a person familiar with the matter. Twitter Music suggests artists and songs to listen to based on a variety of signals, and is personalized based on which accounts a user follows on Twitter. Songs are streamed to the app via SoundCloud. Twitter Music, which is set to arrive in the wake of key competitor Facebook overhauling the music section of its News Feed, shows Twitter taking new steps into becoming a full-fledged media company. The app acknowledges the key role music has played in drawing new users to the service -- particularly younger, mainstream users. Pop stars have some of Twitter's most popular accounts, with followings in the tens of millions. The TwitterMusic account has 2.3 million followers -- not a bad perch from which to launch an eponymous app. Twitter and We Are Hunted did not respond to multiple requests for comment. Unlike Vine, the video sharing app that Twitter released in January, the music app carries Twitter branding. The app's icon consists of a silver "play" button with the familiar blue Twitter bird looking down on it from the corner. Once it launches for the first time, the app offers a short guided tour. Users with Twitter accounts are invited to sign in so that they can received personalized music recommendations. It's also possible to use the app without having a Twitter account, which could help attract new users to the service. The app has two more tabs: 'Popular' brings in songs trending on We are Hunted, and an 'Emerging' tab tracks up-and-coming artists. 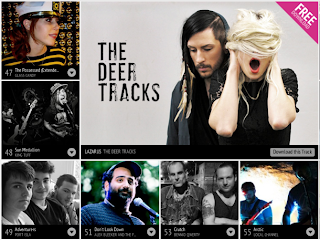 Artists and songs are displayed in an elegant grid design. Tapping on the tile for an artist causes the tile to expand, showing a short biography along with links to any music the artist has stored on SoundCloud, or to song previews from the iTunes store. Users then tap a 'play' button to start streaming the music. So far, the app does not integrate with Spotify or other streaming services. One aspect of the app artists are sure to like -- users can follow them on Twitter directly from Twitter Music. Twitter Music will be powered by technology built by We Are Hunted, which was acquired some time in the last six months, according to our source. Terms of the deal were not available. We Are Hunted, whose free music discovery service remains available, was created by a group of Australian software developers in 2009. Stephen Phillips, who founded a news aggregation service called Wotnews, built the site along with Richard Slatter and Michael Doherty. A fourth founder, Nick Crocker, has since left the company. Angel investor Graeme Wood, founder of Australian travel site Wotif, put $3 million into the company in the company's only disclosed investment. On April 17, 2009, they opened We Are Hunted to the public. The service creates a kind of Billboard chart for online music, monitoring popular songs on blogs, social media, message boards and BitTorrent. Users can stream music, create playlists and share their favorites on social media. The team has also released a series of music discovery apps for smartphones and tablets, including Music Hunter for iPad and SuperSonic for iPhone. We are Hunted formed a number of partnerships to create other standalone apps, including Pocket Hipster, a novelty app created with the Echonest that poked fun at hipsters while also promoting new music. It was a launch partner with Spotify, where it built an app to let users listen to We Are Hunted charts from inside the Spotify client. As of last June, We Are Hunted said it was getting about 1 million unique visitors a month. Today We Are Hunted is based in San Francisco. The team is said to be fewer than 10 people. Meanwhile, the founders' bios have been removed from the We Are Hunted site. The We Are Hunted Twitter account hasn't tweeted for two weeks. The question for Twitter will be whether a groundswell of users find the app useful enough to displace the existing options for music discovery, which are numerous and popular. Pandora has more than 67 million active users; Spotify has more than 24 million. Facebook made music a key focus of its recent news feed redesign, and Google is striking deals to build a subscription music service of its own. Twitter Music looks fun to browse, but it may find it hard to compete against more full-featured music apps, which among other things allow for offline storage of songs.